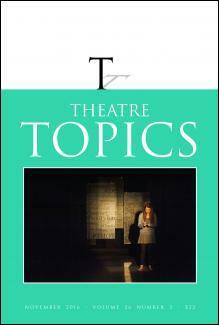 Theatre Topics is a peer-reviewed journal published by the Association for Theatre in Higher Education (ATHE).Topics is committed to publishing original scholarship written in accessible, well-defined language addressing a wide range of subjects, with an emphasis on articles that reflect the intersection of theory and practice. The journal is published three times a year (March, July, and November). Topics’ readership includes theatre educators, practitioners, and scholars. Subjects of interest include theatre practice (acting, design, directing, dramaturgy, playwriting, etc. ), theatre pedagogy, advocacy, and applied theatre.